A series of videos created for The Underpinnings Museum by Sarah Hardcastle and Gill MacGregor, as part of the Collaborative Unit of their MA courses at London College of Fashion. Between February to May 2017, The Underpinnings Museum worked directly with MA students at London College of Fashion as part of their collaborative unit. Students Gill MacGregor and Sarah Hardcastle worked together on a project that saw the creation of our first ever physical exhibition and a series of videos exploring select archive pieces in detail. The series was conceived by Sarah Hardcastle, as inspired by the almost voyeuristic nature of the contemporary ‘Unboxing’ video, in which usually luxury goods are unpacked and near-fetishised on camera. The allusions to this genre are further contextualised by the use of archival acid-free tissue paper and cotton gloves: these accessories are a necessity to archive storage and handling, and highlight the subjects of these videos as firmly unattainable. The videos explore selected archival pieces in detail, giving the viewer an intimate insight into garment elements that ordinarily remain hidden. Videos by Sarah Hardcastle, MA Fashion Media Production, London College of Fashion, and Gill MacGregor, MA Fashion Curation, London College of Fashion. As our research began to focus on the Underpinnings Museum’s large collection of garment packaging and branded items, this part of the project was really inspired by comparison to contemporary retail experiences. We were drawn to the strangely intimate world of online unboxing videos, where the ‘unboxer’ shares the experience of revealing an item to the viewer, describing the process and paying intricate attention to details such as presentation and weight, slowly and meticulously untying ribbons and unwrapping tissue. The popularity is no doubt due to the viewer being able to engage in an experience that may not necessarily be available to them. We compared this with our own access to the Underpinning Museum archive – the thrill of unboxing the otherwise untouchable archive pieces with the thrill of a shared online experience. The additional ‘reveal and conceal’ undertones that came from the handling of exquisite lingerie added even more depth and intimacy to the experience. 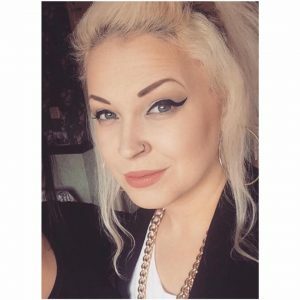 I’m studying MA Fashion Media Production and I have an interest in fashion film and multi media design. 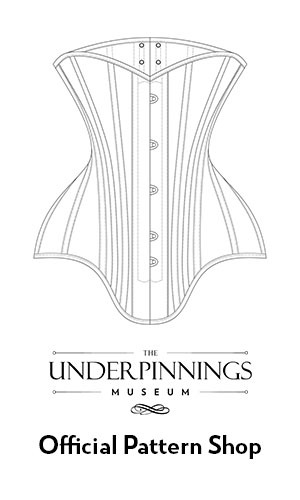 I was drawn to the Underpinnings Museum project because of my long-time obsession with the spectacle of lingerie and its underlying themes of eroticism and gender performance, which are key themes in my own work.